Today, a lot of material was collected in astrophysics research. The achievements of space researchers are astonishing, the existence of neutrino’s telescopes and of internal structure and seismology, that are capable to glance into the bowels of the Sun, today it seems like science fiction. The high speed of technical development, promotes fast increase in the stream of scientifically received research information. Unfortunately, comparing to the research and technical breakthrough, the theoretical base of astrophysics is being dragged behind for almost a hundred years, and represents a heap of the separate, inconsistent theories which aren’t connected with each other. To say the least of it, these theories are far even from science fiction. They are based on outdated physical concepts that dominated at the beginning of the twentieth century. Why these mistakes have been made, taking into account that these theories were developed by the clever and educated people? First, mistakes were made initially, that is the first scientific papers. Errors in subsequent works taken away theory further from the truth. The second, the lack of the required number of objective scientific research information. Scientific and technical equipment for space exploration was primitive and made it impossible to get a complete and objective research information. Thirdly, there was no rocket science.The real physics of stars is based on the nuclear physics. That means that everything that occurs in a star and to a star has to be considered through the laws of nuclear physics. But in the beginning of the past century, the nuclear physics did not exist yet. From the forties of the twentieth century, all scientific works on nuclear physicist have been classified, so the majority of the researchers did not know about them. This means that the astrophysics has been developed during past century without the participation of nuclear physics, the theories developed were initially erroneous. Fourth, the researchers of space are astronomers and theorists, instead of physicists, nuclear engineers, they are not analysts. That explains the low quality of the theoretical development. Fifth, while developing the theory about stars and the Sun, a star considered as a physical phenomenon, instead of as an engineering construction, a nuclear reactor. In the given analytical work, a new approach to research of a star is taking place. The star considered as an engineering construction – a nuclear reactor which develops thermal and nuclear energy. Each component of a star is considered as a separate mechanism which is maintaining an its working functions, in this engineering device. The physical basis of modern astrophysics is «the theoretical physics» and «the quantum mechanics», theories which have become outdated and erroneous. Today, the scientific research material that was saved up demands more serious processing and an analysis. In order to understand the physics of processes occurring in space, it is necessary for us to analyze the physical processes which occur in terrestrial conditions and to project them on space objects. We shall consider some physical processes which will help us to look at physical processes in a space in a new way. There are many mistakes and errors in the modern astrophysics, and we shall confront them in this work and will be obligated to analyze and deny them. One of such mistakes is the opinion of scientists about the impossibility of synthesis of kernels of heavy atoms in stars. In the beginning of the twentieth century, Eddington has stated a hypothesis, about allocation of energy in stars, due to the synthesis of kernels by atom of hydrogen in kernels of atoms of helium. Since then there is a dispute among the scientists, about the possibility of synthesis in bowels of stars, kernels of higher weights, than at helium. By theoretical calculations, the temperatures inside of a star are hardly sufficient for synthesis of easy kernels, but on practice, we see the opposite phenomenon. In a chemical compound of stars including the Sun, heavy elements are being found out. The existence of heavy elements in the structure of planets and the Earth speaks about their synthesis in stars. And if not in stars, then, where?! The history of opening of the 99-th (Es) and the 100-th (Fm) elements of a periodic table during the test for «hydrogen» bomb, speaks unequivocally about the possibility of synthesis of heavy elements in stars. If the explosion of a «hydrogen» bomb has sufficed for synthesis of 99-th (Es) and 100-th (Fm) elements, than in stars there should be the conditions for synthesis of heavy kernels, since the capacity of energy created in a star is higher than a bomb’s. But practice shows that the synthesis of heavy kernels in stars exists. Hence, it is necessary to search for other solutions. The variant of heating the substance of a star and definition of the necessary temperature for synthesis, by means of constant of Boltzmann does not inspire trust since it is developed for thermodynamic processes in gases, and thermonuclear synthesis is related to processes of nuclear where actions of thermodynamics laws are limited by laws of nuclear physics. If practice and theory contradict each other, it is necessary to change the theory, instead of ignoring the practice. Let’s consider the experience of human under the decision of a problem of synthesis of kernels. The creation of huge temperatures, in billions and hundred billions degrees while is impossible. But, the human synthesizes kernels of atoms of periodic system, without heating to such temperatures. We will consider ways of synthesis of kernels of atoms applied by the human. The first way: Accelerators of particles. The second way: It is used in a «hydrogen» bomb. A vessel with tritium and deuterium is being surrounded with a uranium nuclear bomb and blown up. As a result of the explosion of a uranium bomb, the part of the blown up substance takes off outside, and other part, under the third law of Newton, with the same force compresses deuterium and tritium, that gives huge speed to kernels. But, it already influenced volumetric, and directed to the central area that strengthens the action of compression. As a result we receive synthesis of kernels of atoms at temperatures that are lower than calculated. Why the human considers, that the nature is sillier than him? Further we shall see that the nature not only is not sillier than the human, many times it is far more rational and economical. Analyzing the schemes and processes operating in space, we shall understand, on how many all is created ingeniously, and that proves unequivocally the existence of the Supreme reason – reason of Our Creator. The mankind approaches to the level of knowledge, «knowledge Supreme, through the knowledge of its creations». Let’s disassemble the scheme of a hydrogen bomb, in more detail. 2 – area of an arrangement of a uranium bomb – «detonator». Not an unimportant role in the process we check is the form of the bomb – the «Sphere». This form gives concentration of force in the central area, which strengthens the compression of a hydrogen component of the bomb, and, hence, synthesis of easy kernels. In this section we shall disassemble some peculiarities of the spherical form. These peculiarities increase the probability of synthesis of both easy and heavy kernels. In the nuclear processes occurring in stars, as paradoxical as it may be, one of leading roles, and probably the most important one, is played by the spherical form of a star. It allows to concentrate the energy allocated in a star. This surprising peculiarity of the spherical form, has made synthesis of kernels in nature possible with the most economic parameters. The form and the device of a hydrogen bomb are the clear proof of our words. In figure № R-1.2 we see the simplicity and genius parameters of the spherical form which allows to concentrate the action of forces, from all volume, in the center of a star. From the figure it is visible, that the external layers of a sphere have a lot of atoms (kernels), than internal. Hence, at equal distribution of allocation of energy on the volume, concerning number of kernels, the allocation of energy will be more in layers being further from the center since with the increase in radius of a sphere, the quantity of kernels (atoms) in layers increases. Hence, allocation of energy in a sphere will work on its compression. Let’s consider a sphere, consisted of gas and liquid, with radius Ra where «A» is a point on a surface of the given sphere on the figure №R-1.3. Let’s assume that force F operates on a surface of the sphere, directed to the center. On the surface with a point «A» under the action of force F, the pressure directed to the center is created. If will go lower to the sphere on depth «H», on the level of point «N», we shall appear on a surface of sphere, with radius Rn. The force acting on areas Sa and Sn is the same and equal F. As, the area of a surface of a sphere with radius Rn is less, hence, the pressure in point «N», will be higher. From the stated above, the pressure created by force F and directed into the center will increase with the approach to the center of the sphere. In other words, in our case there is a concentration (accumulation) of force in the center. This peculiarity, concentration of force, radiation, energy in the center, is one of the most important peculiarities of the spherical form. Probably, due to this peculiarity, there are processes of synthesis both easy and heavy kernels in stars. Let’s consider the dependence of change of dynamic pressure in the star’s sizes, under the condition that the dynamic pressure upon the surfaces stars considered by us is identical and is equal 1Pa. We shall consider cases when the radius of a star we’re interested in is equal: 1Rs – to one radius of the Sun; 2Rs – to two radiuses of the Sun; 3Rs-to three radiuses of the Sun; 5Rs-to five radiuses of the Sun (Rs – radius of the Sun). We have calculated the changes of pressure at different levels, and the schedule №G-1.1 has been constructed by the results of these calculations. It is visible from the given schedule that at increase in radius of a star, the dynamic pressure in its bowels, increases in square dependence. So, a star with radius twice has more than radius of the Sun, at a level of radius of the Sun, the pressure will be twice more, than on a surface of the Sun. At the radius of a star in three solar radiuses, the pressure increases up to nine solar. At the radius of star in five solar radiuses, the pressure is up to twenty five. At a level of 0.2 solar radiuses, where the pressure in a star with radius of the Sun increases in 25 times, the pressure in a star with radius twice more than solar – the pressure increases by 100 times. In a star with three radiuses of the Sun – the pressure is by 225 times higher, and in a star with five radiuses of the Sun – pressure is higher by 625 times. That means, with the increase in radius of a star, the pressure of compression of its bowels, in square dependence that increases speed of synthesis of kernels increases, and increases the probability of synthesis of heavy kernels. The increase in the sizes of a star influences the speed of synthesis not only due to increase in pressure in a star, but also due to increase in volume of the star that allows to increase the quantity of kernels participating in synthesis. The given increase already has cubic dependence as shown in the schedule №G-1.2. So, the increase in radius of a star in 3 times, increases the volume of a star in 27 times, at increase in radius of a star in 4 times, the volume increases in 64 times, at increase by 5 times, the volume increases by 125 times. Hence, at increase in sizes of a star, by pressure of compression of a matter in its bowels and by quantity of by matter that leads to increase in by speed of synthesis of kernels and to increase in by synthesis of heavier kernels. The increase in speed of synthesis in a star reduces its time of a life, and increases by quantity of heavy kernels, approaching their weight up to «critical». At stars with greater weights, the quantity of heavy kernels exceeds «critical» weight, which leads to a nuclear explosion (to a collapse) of stars. It is probable, that particularly the increase in the volume of a star and pressure in it, during the increase of its sizes, reduces time of life of a star, and the reason for the accumulation of heavy kernels of atoms in the kernel of the star (in «the white dwarf») that leads to a collapse at heavy stars. From the analysis lead to this section, it is possible to draw a conclusion, that the form of the star – a sphere, is capable to concentrate and strengthen power processes. We have considered the surprising peculiarities of the spherical form. Such design of a star, as a nuclear reactor, promotes the synthesis of practically any elements of the periodic table, and possibly even of the over heavy kernels of atoms, which goes beyond the aisles of the periodic table and cannot exist in terrestrial conditions. We know that for the synthesis of two kernels and more, it is necessary, that at least part of them will have kinetic energy and a speed sufficient for overcoming the coulomb barrier. Where from a kinetic energy for synthesis appears in kernel? Let’s consider the process we’re interested in on the example of three kernels: «A» and «B», which after the synthesis turning into a kernel «C». And this kernel «C» should participate in the following acts of synthesis. Where from a kinetic energy for synthesis appears in kernel «C»? c — The speed of light. The impulse from this radiation is being transferred to kernel «C», according to the third law of Newton. Hence, the impulse of kernel «C» depends on the impulse of kernels «A» and «B» and on the impulse received during the radiation of energy Δm . c2. We see that on the change of speed of kernel «C», the allocated energy influences EI = Δm . c2. Is the synthesis of heavy kernels in stars is possible? As a result of the research we have received formulas for defining speed and energy of kernel «C» at moment of synthesis. Analyzing them, we can draw a conclusion, whether synthesis of heavy kernels in stars is possible. Second, during the tests of thermonuclear-hydrogen bomb the heaviest elements in a periodic table, Es-99 and Fm-100 have been synthesized. The capacity and allocation of energy of stars are much higher than the capacities and allocation of energy at the explosion of thermonuclear-hydrogen bomb. Hence, synthesis of heavy kernels in stars is possible. And the analysis of the formulas received by us can only testify about whether our calculations are true or not. The practice says – «Yes, there is a synthesis of heavy kernels occurring in stars!» The theoretical physicists of the past century didn’t consider the dynamic conditions within the stars, the kernels velocity and particles created during the synthesis and the form of the star itself, which creates favorable conditions for the synthesis of heavy kernels throughout the whole periodic table of elements. Going forward, as the proof of the possibility of heavy kernels synthesis in stars, we’ll consider briefly the analytical data we obtained in chapter The analysis of «a solar wind». In this chapter we calculated the velocity of the kernels obtained by the synthesis. The data from these calculations matches the parameters of the solar wind. Comparing the results of these calculations with the parameters of moving particles in particle accelerators, we see that the kernel obtained by the synthesis has the same speed as the kernels which were accelerated in accelerators for the production of synthesis of heavy kernels. In the particle accelerators, the light kernels have the speed, while the target kernels are not mobile. In a star, most of the kernels involved in the synthesis have high speed, which facilitates the synthesis of heavy kernels. Let’s consider some examples. Reaction 31H+10n=42He и 21H+10n=31H occur without overcoming the Coulomb barrier. For such synthesis reactions is not necessary to overcome the Coulomb barrier! A Spectroscopy of the solar surface shows the presence of all elements of the periodic table, including the transuranium elements. That means that the spectroscopy of the Sun gives us information not about the chemical composition of stars, but about the synthesis of kernels in the upper layers of the star. Consequently, in the «active zone», we see a synthesis of all elements of the periodic table, and this proves the existence of synthesis of transuranic elements in the star. In a star, there is a process of transformation of hydrogen in heavier elements of the periodic table. Having predicted the possible variants of the given process of transformation, it is possible to define the events and the processes which are occurring inside of a star. Knowing, the events and the processes occurring inside in a star, considering the necessary conditions and design features, for the creation of these conditions, events and processes, it is possible to predict a structure of a star, as a reactor for synthesis of kernels. Possible «chains» of synthesis of kernels are made theoretically, from hydrogen up to kernels of atoms with Z=111 and A=272, being in the end of the periodic table of elements. «Chains» of allocated energy are being made, and their analysis has led to a conclusion, About necessity of correcting of modern physics of stars and the Sun, and of the theories about their structure. We consider the device of a star, as the device of a nuclear reactor in which, technically and technologically there should be conditions for a synthesis of kernels of atoms. The star is a huge nuclear reactor in which, there are nuclear reactions. Is the existence of such huge energy source and storehouse of fuel simultaneously is possible without the law which copes this miracle? Whether it is identical, the allocation of energy during the synthesis of kernels of atoms on all periodic table with mass numbers from 2 and more 200 (A> 200)? Why during the allocation of huge energy the star does not break off? The analysis of allocation of energy will respond to these and some other questions during the synthesis of kernels on a chain from a proton and a neutron up to the heaviest kernel with Z=111 and A=272. Let’s construct the schedule № G-2.1 based on this data. From the schedule № G-2.1 (allocation of energy at synthesis of kernels 13655Cs, 13656Ba, kernels Z=111, A=272) it is visible, that the energy allocated in time of synthesis is distributed in irregular intervals on the chain. Most of the energy is allocated at the second and third steps, at the synthesis of isotopes of hydrogen H and helium He. Allocation of energy at following steps of synthesis is sometimes less, and at the moment of synthesis of kernels with Z> 50, the value of allocated energy aspires to zero and passes to the negative zone. That means, the synthesis of kernels in this zone goes with absorption of energy. Though we cannot define allocation of energy for each act of synthesis by time, in this case it is not important. The place where the energy will be allocated is the important. So the maximal value of the allocated energy is necessarily on isotopes of kernels of hydrogen H and helium He. Since hydrogen and helium are the easiest atoms, they are located in the highest layers of the Sun; hence, the maximal value of the allocated energy occurs in the top layers of a star. Superfluous allocation of energy in the top layers leads to compression of the lower layers. Synthesis of heavy kernels which are closer to the center, goes with absorption of energy, hence, the resistance power to compression is practically not present. The effect of absorption of energy during the synthesis of heavy kernels is the positive factor for star existence. – First, the energy allocated during the synthesis of kernels of the top layers, is not accumulated in the center in form of a net energy (kinetic energy of particles) that, probably, should lead to the break of a star, and is absorbed at the synthesis of heavy kernels and is possible, «starts» the thermonuclear synthesis of the easy kernels which are being located on the lower layers of a gas-plasma mix. This new epicenter of thermonuclear synthesis (explosion), under the action of Archimedes forces, should rise in the top layers of a stars atmosphere (in photosphere and chromospheres). – Second, there is an accumulation of a nuclear energy in heavy kernels which allocated in the form of radiations and in the energy of explosion at a collapse. – As the basic variant of the synthesis in stars in the end of life, when just the easy kernels contain enough allocated energy for the continuation of the synthesis. 2) And in He environment with Z=2, A=4 (He-4). That means, the kernel with Z=111, A=272 is received during the synthesis of an «initial» kernel and kernels of hydrogen H-2 (in the environment of hydrogen), and at moment of synthesis of an «initial» kernel and kernels of helium He-4 (in the environment of helium He-4). These variants are interesting since it is possible to analyze the cases when synthesis in a star follows the account of energy of easy kernels, and heavier kernels do not have sufficient energy for the synthesis among themselves. According to the calculations plotted the schedules №G-2.2. «A kernel + Hydrogen with A=2 (H2)» and «the Kernel + Helium with A=4 (He4)». From schedules №№ G-3.5, G-3.6 it is visible, that in the considered case, most of energy is allocated in the field of the synthesis of easy kernels (H-2 and He-4). During a further synthesis of a kernel, the allocation of energy is much less. Hence, and in this case there is a compression of the central areas of a star that confirms the received earlier results and the conclusions drawn by us. Forces of compression not only condense the matter of star, but also keep its gas atmosphere. From calculations and the schedules constructed by them results it is visible, that the maximal allocation of energy occurs during the synthesis of easy kernels which concentrated in the top layers of a star, and it confirms the activity of nuclear processes in stars atmospheres (Sun). – Most of the energy in stars is allocated during the synthesis of easy kernels which due to their small weight are located in higher layers of stars, than atoms of heavy elements and their kernels. Hence, most of the energy is allocated in the top layers. – Probably, under the action of dynamic processes occurring in the top layers of an atmosphere, in the average or bottom layers of an atmosphere of a star areas of thermonuclear reaction of synthesis, easy kernels (nuclear explosions) are being formed. These areas of thermonuclear reaction of the synthesis, under the action of Archimedes force are rising in the top layers of the atmosphere and form a photosphere and chromospheres. – With the increase in weight of kernels, the allocation of energy during the synthesis decreases, and during the synthesis heavy and over heavy kernels – the energy is being absorbed. – The allocation of greater energy in the top layers compresses internal layers of a star and keeps the atmosphere in its volume. – In the central part of a star, there are heavy kernels that under the pressure of compression by gravity gather and condense «the white dwarf». Probably, further synthesis of heavier kernels goes on the surface and inside «the white dwarf». In «the white dwarf», heavy kernels, atoms and molecules are being collected, and there are the reason of a collapse (explosion) after the «death» of a star. – At moment of synthesis of kernels the energy is allocated in the different parties. Part of this energy is allocated and dissipates in space. Other part directed inside, raises the temperature, the pressure in the gas-plasma mix (creating conditions for synthesis of kernels), generates process of synthesis and absorbed during the synthesis of heavy kernels. The part of energy allocated in inside stars, is absorbed by heavy kernels of atoms, and accumulated in «the white dwarf», forming and increasing its weight sizes. The quantity of heavy atoms in a kernel of star (in «the white dwarf») increases. In conditions of stars, these heavy kernels are natural accumulators of energy. – Large allocation of energy during the synthesis of easy kernels, informs greater speed to these kernels, increasing their impulse. At the synthesis of heavier kernels, the allocation of energy is less, so is their speed and impulse; hence, the probability of synthesis of heavier kernels decreases. At heavy and over heavy kernels, during the synthesis, energy and weight are being absorbed, that reduces the probability of their synthesis among themselves to zero. But the probability of synthesis of heavy kernels under the influence of dynamic pressure from easier kernels (at their synthesis) exists. There is a probability of a synthesis between heavy kernels as well, due to dynamic compression of the substance to the center of a star, by the action principle of a hydrogen bomb. One of the most interesting natural phenomena – is the «a solar wind» (or a star wind). Modern researchers lead huge work on gathering the information about it. But unfortunately, the base theories about the Sun structure, written almost hundred years ago, like other theories in modern astrophysics, have become outdated, and the collected information remains without application. Actually, as the analysis of blood of the human gives the information on its health, the analysis of parameters of «a solar wind» can give us huge information about a structure and about its state. And for now, there are many questions regarding the operating theory, which put its correctness under doubt. 1. Since the heating of external layers of a star goes from the center, the parameters of these external layers should be almost stationary and unified or varying smoothly. The speed of particles in «a solar wind» should be as stationary or to vary in a small range. But the parameters on the Sun surface change not permanently, speeds of particles are different and the range of these speeds is big. 2. If the heating of a star goes from the center, the temperature of all particles in «a solar wind», should be identical. Actually – the temperature of particles is different. 3. If the speed of a particle depends on the influence of a magnetic field, then its speed in «a solar wind» would depend on a charge of the particle. With the increase in the charge, the speed of a particle should increase. Considering a variable magnetic field, acceleration of the charged particles should increase. The acceleration of positively charged particles and the delay of electronic gas. Acceleration of electronic gas and delay of positive particles. Actually – the maximal speeds particles are with small charges, electrons, kernels of hydrogen and helium. 4. Neutrons do not obey to the activity of magnetic fields. If neutrons are born in the center of the Sun, the probabilities of reaching the external layers of the star, while keeping their high energy – are not exist. Actually, the Sun radiates neutrons of great energies and plenty of them all over the surface. The time of a neutron life is about 15 minutes, which makes the radiation from a surface of a star, by a neutron born in its center impossible. Credit: NASA, CGRO, COMPTEL collaboration. 5. X-ray radiation and γ – radiation of the Sun. The sun in X-rays (space laboratory «Skylab»). Similarly, radiation of neutrons, x-ray and γ – beams, cannot keep the high energy, having passed through all thickness of the Sun. Maps and photos of a star made in x-ray and γ – beams, show areas of more intensive and less intensive radiation. 6. The chemical compound of «a solar wind» does not coincide with a chemical compound of the Sun. In the chemical compound of the Sun all the elements of the periodic system appear, including uranium. The chemical compound of «a solar wind» includes elements from hydrogen up to nickel and zinc. 7. One of the most unclear questions for researchers is how the layers located around the kernel of a star, having lower temperature, manage to heat up the hotter layers of the photosphere, chromosphere and the crown. 8. Neutrino is being born during the synthesis of kernels of hydrogen and helium. If the synthesis of hydrogen and helium occurs in a kernel of the Sun, the changes in the neutrino stream should depend on the changes occurring in a kernel or to a kernel of the Sun. Actually, the changes in a neutrino stream, corresponds to the changes of processes in layers of the atmosphere of the Sun. 9. By the Eddington theory, according to whom the energy is allocated in the kernel of a star, the nature of dark spots is not clear, or speaking more precisely, is not explainable. – The theories operating today about the structure, physicists of stars and the nature of «a solar wind» have become outdated. – Synthesis of kernels of atoms occurs inside of a star. The centers of thermonuclear synthesis rise in the top layers of an atmosphere of a star, in the form of high-energy plasma forming «an active zone». The centers of thermonuclear synthesis are formed as a result of nuclear explosions inside of a star. Thermonuclear synthesis with the allocation of a most part of the energy doesn’t takes place inside of the kernel, but in the top layers of the atmosphere: the photosphere, the chromosphere – we shall name this area – the «an active zone». The structure of an active zone is probably includes the areas adjoining to the photosphere and chromosphere: the top layers of the convection zone and the bottom layers of the crown. Only at such design, the existence of each fact listed above, while having logical explanation. 1. The non-stationary speed of particles in «a solar wind» is explained by the different impulses received by these particles in different reactions of synthesis at different allocation of energy in these reactions. The Magnetic fields of a star render influences on speeds of the particles in «a solar wind», but aren’t as much significant, as it was considered earlier. 2. At the synthesis, in «an active zone» (photospheres, chromosphere), different quantity of energy is allocated in the different reactions of synthesis, hence, the particles in «a solar wind», will be different not only by speed, but also by different temperature. 3. The speeds of particles depend, mostly, on the energy allocated in the reactions of the synthesis where these particles participated. So, at the synthesis from two kernels 4He of hydrogen 2H=D, D+D=4He, the highest amount of energy is allocated, hence, in the structure of fast «a solar wind» there should be kernels 4He, this fact corresponds to the validity. 4. The high-energy radiation of neutrons, x-ray and γ – beams can be explained by the existence of nuclear reactions in the top layers of the Sun, as the source of these beams. If the synthesis would take place in a kernel of a star, then the radiations assorted by us would have smaller energy and many times smaller density. 5. In pictures of γ -beams and x-rays, in the areas of strong and dense radiation it is possible that a more intensive synthesis of kernels, which radiates γ -beams and x-rays. The hot gas-plasma mix, under the action of high pressure and temperatures, tries to extend and leave the borders of a star. «The active zone» constructed from the photosphere and chromosphere impedes this expansion. The centers of thermonuclear synthesis gather in the volume of «an active zone» and form the environment of a star. The radiation of the active zone constrains the expansion of gas-plasma mix and keeps it in the volume of the star. From the external party, the radiation from «the active zone» is «the solar wind». High speed and more intensive radiation are better in restraining the gas-plasma mix from breaking through to the surface («the active zone») stars. In case of decrease in the intensity and the capacity of energy allocation during the process of synthesis, the intensity, capacity and the speed of radiation in «the solar wind» decreases as well. Hence, the impulse restraining the gas-plasma mix from expansion, and the thickness of «the active zone» should decrease as well. At decrease thickness of «the active zone» and the impulse of radiation received during the process of synthesis, the probability of penetration and break of particles of the gas-plasma mix through volume of «an active zone» and into the space increases. Probably, this can also explain the existence of coronary holes and «dark» spots on the surface of a star. Probably, in areas where the coronary holes are observed, nuclear reactions are taking place, during which γ -beams and x-ray are allocated less. 6. A chemical compound of «a solar wind». Difference of chemical compounds of the Sun and «solar wind», can be explained by the fact that the energy is being allocated only during the synthesis of kernels easier than Zn. With the increase in the weight of a kernel, the energy allocated at its synthesis decreases, while the weight increases. Hence, the impulse received by a kernel, at the process of synthesis, decreases. The speed of a kernel decreases also. It occurs for two reasons: the decrease in allocated energy and increase in the weight of a kernel. For overcoming the gravitation of a star, the kernel should have high speed. After Zn the synthesis of kernels goes at the minimal allocation of energy or at its absorption. Hence, the kernels received as a result of such synthesis, cannot have an impulse, since allocation of energy does not occur. If among such come across kernels, which allocate energy at the moment of synthesis, its values aren’t high, and their speed is not enough for being a part of «a solar wind». 7. According to the theory offered by us, the heating of a star occurs not from the center to the periphery, but from the top layers of an atmosphere to the center, and inside of a gas-plasma mix in the centers of thermonuclear synthesis. 8. Since the neutrino is the indicator of kernels synthesis of hydrogen and helium, by analyzing the neutrinos radiations of a star, it is possible to define the places of synthesis of hydrogen and helium. The period of change of neutrino radiation at the Sun is 27 days, which coincides with the period of rotation of external layers of the Sun atmosphere. And the arrangement of area of the maximal radiation neutrino as coincides with external layers of an atmosphere of the Sun. Hence, most of the neutrino is born not in the kernel, but in the top layers of the Sun. This fact implies that most of the synthesis of kernels of hydrogen and helium occurs in the top layers of the Sun. Since during the process of synthesis of hydrogen and helium the maximum quantity of energy is allocated, here (in the top layers of an atmosphere) the most of the energy of the star is also allocated. The analysis of the neutrino radiation map, figure №R-3.3, states that the maximal density of the neutrino radiation coincides with the arrangement of the top layers of the star atmosphere, and the periodicity of change of this radiation – 27 days, with the period of rotation of the same top layers of an atmosphere. It is visible from the figure that the synthesis of easy kernels with neutrino allocation occurs, probably on the surface of the star kernel, and in the middle of the atmosphere. Probably, in the average part there is a meeting of dynamic waves from the bottom layers of «the active zone» and wave from the star kernel, part of making dynamic waves going from a kernel are probably the reflected dynamic waves. In a place of a meeting of these waves, thermonuclear synthesis occurs probably, we see it on the map. – There is a synthesis of light kernels at the core surface of the Sun, due to the presence of the reflected wave from the surface of the dynamic core of the star. – A mixed option, there is a division and disintegration of heavy kernels on the surface, while the surface of the core of the Sun there is a synthesis of light kernels. For more serious analysis of the thermonuclear synthesis process inside the Sun, it is necessary to investigate the dynamics of change in neutrinos’ radiations during the time. The nature and physics of «dark spots» is unexpectedly very simple. If we shall consider the device of the Sun, according to our theory we shall see that «the dark spots» play a role of safety valves in the thermal boiler named the Sun. Let’s consider a possible variant offered by us, of the device and the principle of action of a star as a thermonuclear reactor. We offer the simplified approach to a structure of a star, as to an engineering design of a thermonuclear reactor. The star consists of the following constructive components: kernels of a star, a gas-plasma mix, an active zone and a crown. The crown of a star is a stream of particles, atoms, kernels of atoms, isotopes, radiations, a full spectrum of the electromagnetic radiations having high density and everything that is a part of «the star wind», while having high speed and radial movement directed from the surface (the top layers of an atmosphere, «the active zone») stars. – There are probably nuclear reactions of disintegration in the crown, and synthesis, leading to allocation of energy. At the removal from a star, the crown passes in a heliosphere. Whether the crown is a constructive part of a star or not, is not a simple question. Proceeding from the facts known to us, it is possible to approve, that the crown does not exist without a star, and the star is not present without a crown. «The active zone» is in the top layers of an atmosphere of a star, there is a thermonuclear synthesis in it, the energy is radiated not only to an external space, but the radiation is directed inside the stars, the expansion of a gas-plasma mix restrains being under a layer of «the active zone». Probably, «the active zone» consists of huge quantity of sources of radiations which are the centers of thermonuclear synthesis. Hence, «the active zone» of star is not only the basic energy source, but also the environment of the star, as the environment (or the case) a nuclear reactor. In the given fact we observe the ingenious decision, Our Creator which has combined the basic energy source – «the active zone» and an environment of a star in a united design. One more ingenious decision of this design is that «the active zone» as an environment (or the case) of stars is not a rigid design. We see the proof to the stated at the tests of hydrogen bombs. At the ground and air tests, the heated areas where were the thermonuclear reactions of synthesis occurs, rose in the top layers of an atmosphere of the Earth, and the more powerfully was a charge of a bomb, the higher the heated sphere rose. «The active zone» replenishes with the centers of thermonuclear synthesis which, are formed in the gas-plasma mix and rise in the photosphere, compensating the reduction of the same centers and outflow of a matter from «the active zone» in the form of radiation, through the chromosphere and the crown. «The active zone» borrows volume, photospheres, chromosphere, and possibly, the top part convention zones and the bottom part of a crown adjoining them. And so, «the active zone» in a star is an energy source and an environment of a star which, keeps the weight of a gas-plasma mix in its volume, and from the external party, due to radiation of «a star wind», from «an active zone», forms the space of a heliosphere and constrains the streams of gas and a dust from space. Processes occurring in «the active zone» create not only a counter pressure, which keeps the extending gas-plasma mix, but makes the temperature rise, pressure and other conditions for the synthesis of easy and heavier kernels inside of a star, whose synthesis goes with allocation of energy, without allocation of energy or with absorption of energy. During a life of a star, heavy kernels are being collected, at the further participation of these kernels in the process of synthesis there is absorption of energy. We shall name heavy kernels of atoms in process of synthesis which, energy is not allocated, or it is absorbed – by slag. The finding of these kernels in «an active zone», even at not so greater concentration can «extinguish» thermonuclear synthesis. In the star there is an automatic recycling of such kernels. By gravity, heavy kernels and atoms fall, and concentrate in the center of a star – in the kernel. Under the action of superfluous pressure, created by the active zone, the substance, which is in the kernel, is being condensed (packed, compressed). The density increases, the synthesis probably proceeds, but with the absorption of energy. The pressure is created by the active zone upon the surfaces of the star, with approach to the center, means to the kernel, increases. At approach to the center of a star, R decreases, and pressure p – grows in square dependence that creates the conditions for the compression of the star kernel and the further synthesis of kernels of atoms, both in the kernel, and in the gas-plasma mix. The dynamic pressure in the star is created as a result of allocation of energy in the process of thermonuclear synthesis. Most of the energy is allocated in «the active zone», hence, the basic source of dynamic pressure is «the active zone». For understanding the given physical process, we should return to the consideration of the device and the principle of action of the «hydrogen» bomb. In the center of the bomb there is a volume with «hydrogen fuel» which surrounded by a charge of a «uranium» bomb. The explosion of a «uranium» bomb compresses a charge of a «hydrogen» bomb and starts a thermonuclear process. There is an explosion of a «hydrogen» bomb. 2 – area of arrangement of a «uranium» bomb – «detonator». Probably, the same process occurs in stars. The shock waves born in «the active zone» in the top layers of the stars atmosphere, directed to the center, compress fuel inside of the gas-plasma mix, and start the next thermonuclear reaction of the synthesis in the star. A detonation of thermonuclear explosions is possible, and inside of the gas-plasma mix, from shock waves going from «the active zone» and reflected, from a kernel of a star, or at the beginning of thermonuclear synthesis in the bottom layers of a star. Probably, the areas of the raised radiation neutrino on a map of radiation neutrino the Sun specify that (figure №R – 3.3). The gas-plasma mix – carries out some functions. The first – it’s a storehouse of fuel. Second- it’s an ideal energy carrier both inside of a star in the form of the heat-carrier, and outside of a star in the form of radiation kinetic energy. Third – in the aggregate of all weight of the star, it is the fuel filter. There are easy kernels, atoms and molecules which allocate energy at synthesis, rise upwards, to the active zone. And slags (heavy kernels) under the action of weight dropping downwards, accumulate in the center of a star, in the kernel, and form «the white dwarf». Fourth – under action of the raised temperature in layers of a gas-plasma mix there is an unpacking of «fuel». That means, at the approach of fuel to the active zone, the fuel, under the action of temperature, passes from the compressed state into gaseous, then into plasma, with particles having greater speeds. Fifth – it distributes the pressure in regular intervals and temperature inside of a star and on a surface of a kernel «the white dwarf». Sixth – it is possible that under the action of pressure in the gas-plasma mix, the «fuel» moves into the active zone for maintenance of the synthesis. Apparently from our analysis, the gas-plasma mix heats up, receiving most of the heat from the top layers of the atmosphere of the star, instead from its center. The given fact gives us the keys to revealing the secrets of «dark spots» on the Sun surface, and the secrets of a solar wind. In order to understand the role of «dark spots» it is necessary to consider the physics of thermal processes occurring in a star, from the position offered by our theory. We have established, that the heating of a gas-plasma mix occurs not from a kernel of a star, but from the top layers of the atmosphere (from «the active zone») and, probably, from the centers of thermonuclear synthesis being in a gas-plasma mix which move to «the active zone». Roughly the active zone includes photosphere and chromosphere. «The active zone» is not only an energy source, but also the non-rigid case of the star, as thermonuclear reactor. Since the environment of a star («the active zone») is not the rigid design, it has peculiarity to be compressed or be stretched (to be deformed) under the action of the processes which are occurring in the gas-plasma mix. Synthesis of kernels of atoms is possible in all volume of a star. In internal volume existence of areas allocating energy is possible too. The increase in the volume of gas-plasma mix leads to extension of not a rigid environment of a star. That means, to the extension of «the active zone». At the achievement of critical values parameters of a gas-plasma mix (temperature, pressure), there is an increase in the volume of the gas-plasma mix that leads to the extension of «the active zone» since it is not a rigid environment and to its break from an interior, in least thick places of the «the active zone». We observe this break in the form of dark spots on the Sun surface. Break of «the active zone» occurs and at powerful nuclear explosions, inside of a star. Such nuclear explosions are possible, both in process of synthesis of easy kernels, and at moment of division of the heavy ones. That means, in a star, in small volume, it is possible on the surface of its kernel in course of thermonuclear synthesis the weight of transuranium elements are higher value of critical weight. In this over critical weight also there is a nuclear explosion to allocation of big quantities of energy. The variant when there is an imposing of dynamic processes from the nuclear explosion of weight of transuranium elements and from nuclear explosions of thermonuclear synthesis is possible. This imposing of dynamic processes gives a rise to the new nuclear explosions in a star which break through the active zone, forming holes in it – «the dark stains». Through the broken through holes in «the active zone», under the influence of the raised pressure, the part of a gas-plasma mix is thrown out in space. The part of the weight pulled out at which the speed is not sufficient for overcoming the attraction of a star, comes back, creating spicules. Other part of the weight pulled out, having high speed, will be a part of «the solar wind». 3. A system of under abnormal condition-safety valves on the excess of pressure in the gas-plasma mix. If to compare a star to a the thermal boiler, the dark spots on the Sun play a role of safety valves which dump (reduce) superfluous pressure by emission of the gas and plasma outside, protecting the boiler from thermal explosion. In a star, the probability of «thermal explosion» is excluded at the expense of absence of strong environment that makes the occurrence of «dark spots» possible. As we stated earlier, in the kernel of the star slags gather, and under the action of dynamic pressure are being pressed in «the White dwarf». It is probable, that in the star kernel, above the surface of «the white dwarf», the layer of the compressed fuel, a layer of molecules and atoms of easy elements – hydrogen, helium, and others is located. That means, the sphere made from slags – «the white dwarf» is shipped in a sphere of greater radius, consisted of the compressed fuel. The areas where thermonuclear syntheses occur are rising up to the top layers of the atmosphere. We have considered how the Sun is arranged, using the new theory developed by us, based on the laws of classical physics. If we lean on the theory given, we see that the information on a solar wind gives us an invaluable knowledge of the star and gives another, absolutely more powerful value. For the analysis of the solar wind it is necessary to define the sources and the nature of its formation. – «Dark spots» – place of break of the gas-plasma mix on a surface of the Sun, through «the active zone». It’s probably possible to add coronary holes to this list, but their deeper studying is necessary for this purpose. – In the active zone there are thermonuclear reactions of synthesis in which, kernels and particles receive an impulse during the moment of energy allocation and are a part of the solar wind. 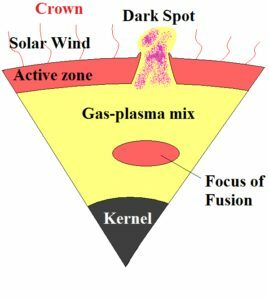 – In «the dark spot» – throttling of the gas-plasma mix occurs (fig. №R-3.5), and the emission of gas-plasma mix, during the nuclear explosions inside the stars (fig. №R-3.6). Particles, atoms and kernels receive high speed due to the expiration in space of gas and plasma, through the hole in the active zone. Since in the nutria of a star, the gas-plasma mix has high values of temperature and pressure, in this case it is possible to hit in the structure «solar wind» of kernels that are heavier than Zn and of kernels in which the synthesis occurs, without the energy allocation, or with minimum allocation. The reasons of the powerful solar flashes with the formation of «dark spots» might be the powerful nuclear explosions inside of the star. A powerful explosion in a star occurs at generation of thermonuclear synthesis, and it is possible, that as a result of nuclear reactions of division during the accumulation of heavy kernels. Powerful short-term explosions are transient allocation of a large quantity of energy in a star. That means, the energy allocated in the star, can exceed the star’s possibility to absorb and to process this energy in time. In these cases come the critical moments, when the concentration and allocation of energy in the star is more than energy the allocated from the active zone, and directed inside the stars. In these cases there is a break of the active zone and the «excess» energy is thrown out in space. If, the environment of the star would be rigid, or an allocation of plenty of energy would take longer time, the star would collapse. Hence, «the active zone» of the stars, is not only a «safety valve» for the gas-plasma mix, but also a power safety lock, dumping the critical quantity of energy into space, saving the star from destruction and death. 1. The synthesis of easy kernels with the allocation of most of the energy occurs in the top layers of the Sun and stars atmospheres (in photosphere, chromosphere). 2. Kernels and particles in «a solar wind» receive high speed, as the result of nuclear reactions of synthesis and disintegration in both the active zone of the star and beyond its limits. 3. The heavy and super heavy kernels of atoms received as a result of synthesis of easy kernels, are being accumulated in the kernel of a star, forming «the white dwarf». – A kernel which in the beginning of life consists of the compressed fuel or easy atoms, during life heavy atoms are collected in the center of the kernel, superseding the easy ones and forming, «the white dwarf». In the end of life of a star, the kernel probably, is consisted of «slags» which have accumulated in the center, forming «the white dwarf», and the compressed fuel, as a result of thermonuclear synthesis which passed into a gas-plasma mix, has partially turned to slag, and partially is thrown out into space. – The gas-plasma mix, surrounds the kernel of star and represents a mix of gas and plasma. Heating of the gas-plasma mix occurs from the top layers of the star atmosphere and from the internal areas, where there is a thermonuclear synthesis with allocation of energy, and is possible, from the centers of division of heavy kernels. – An active zone – the top layers of the atmosphere of a star where there is an allocation of most of the energy – photosphere, chromosphere and the bottom layers of the crown. – There are nuclear reactions of disintegration in the crown, probably, and a synthesis with allocation of energy. The real physics of the cosmos can be found only on our website….